Warning: What you're about to read is a recipe that will leave your kitchen covered in flour for days. Something my mom and I love to make just to keep on hand at all times is hummus. I honestly could LIVE on hummus, I love it so much. And it's so easy to make yourself! Because let's be real, the store-bought stuff just isn't the same as homemade. 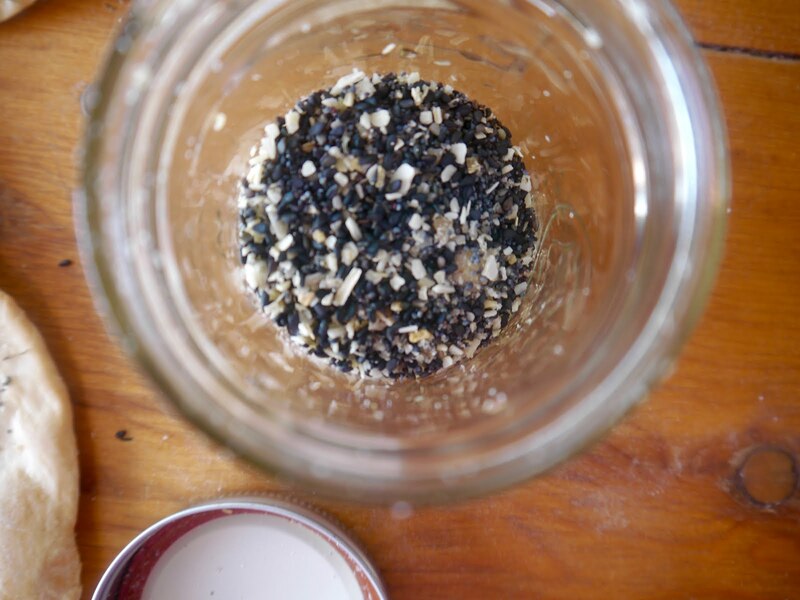 All you do is throw some chickpeas, tahini, lemon, garlic, and salt in a food processor and let it do all the work. 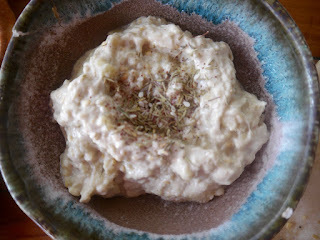 But recently, we've been getting into another dip: Baba Ganoush. It's basically the same exact thing as hummus, but instead of chickpeas, you use eggplant. Now, I've had babaganouche before, but it wasn't until my best friend's mom sent some home to us that I really started to get obsessed with it. Her trick is to char the eggplant first and really bring out a smoky flavor. It's a game changer for sure, and my mom and I can't make it any other way now. Also, you don't even have to have a food processor or blender to make baba ganoush! Since the eggplant will be so soft from roasting, all you need is a bowl and a fork to mix it up. Okay, now onto this Za'atar Lavash. So, I was in the mood to make some pita bread one day, and my mom pulled out a lavash (unleavened) bread recipe she wanted me to try making. 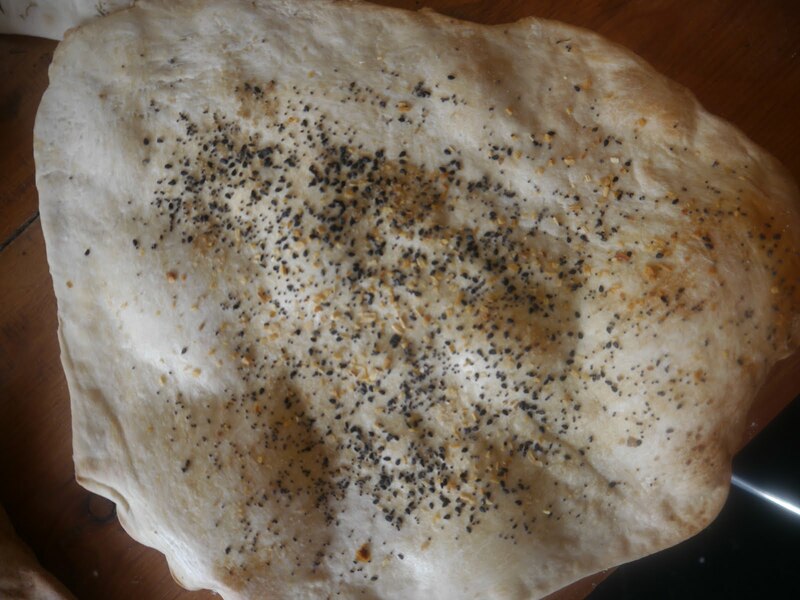 Of course, I coudn't just make regular lavash bread... I had to spice it up a little. 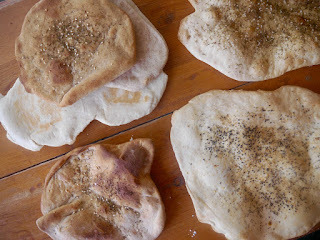 I went with Za'atar because it's my all-time favorite seasoning (Wow, I'm really appreciating my Lebanese roots in this post). 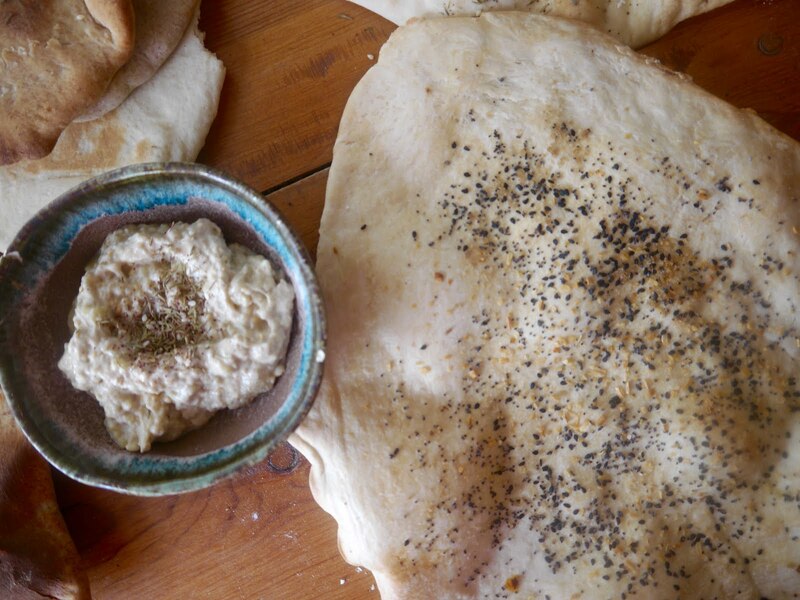 Bonus points for the lavash: it can be made in a mixer, so no need for kneading! 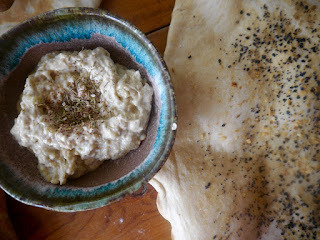 I made both lavash and pita bread and also used some leftover "Everything Seasoning" from my Everything Olive Oil Bread on some of the pieces. I didn't really think about the amount of dough I was making, and let me tell you... I had piles of dough balls EVERYWHERE in the kitchen. 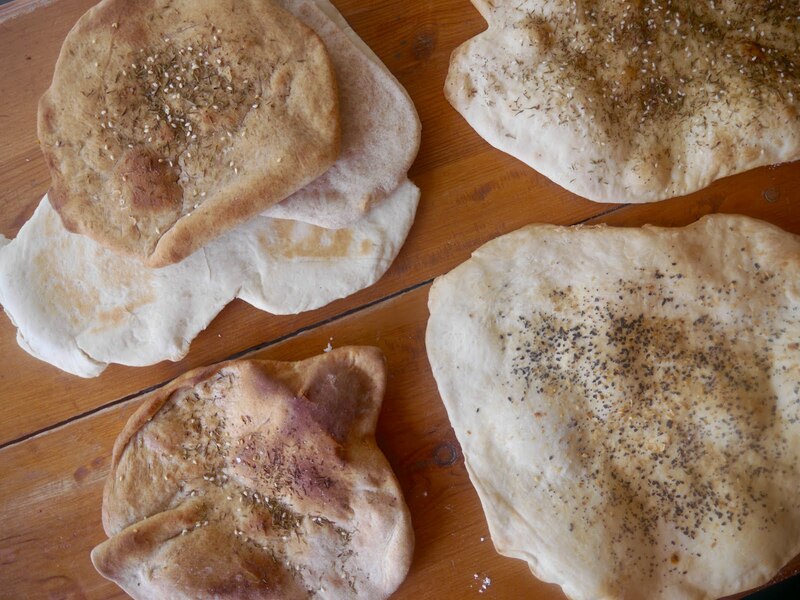 We had pita bread and lavash wrapped up in foil in our fridge for a long time. (This post has been a draft for a long time...) We eventually ran out. There are so many things you can do with them though, so it really wasn't a problem. 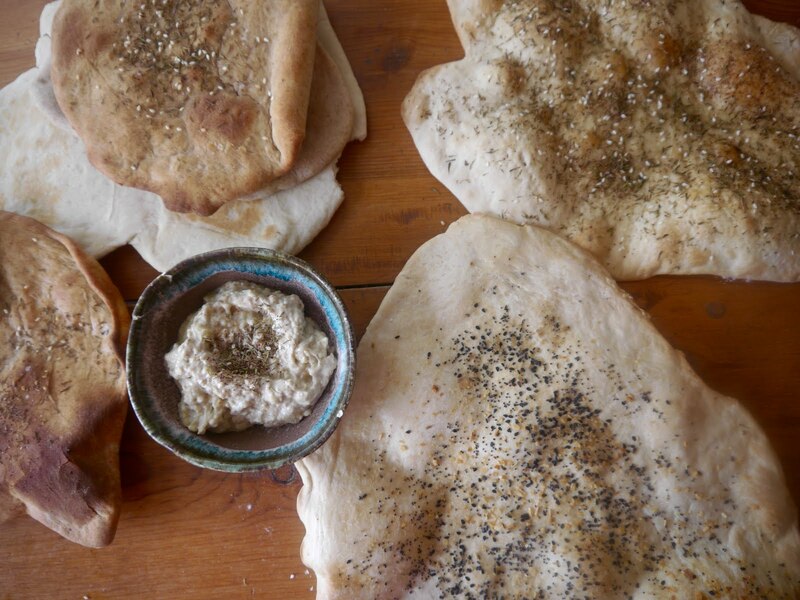 We made flatbreads and croutons, sopped up sauces and runny eggs with them, and also just snacked on them with dips (like hummus and baba ganoush). But back to when I was actually making them... there came a point when I was so tired of rolling dough out and the growing stacks of freshly baked bread were becoming overwhelming that I just gave up. By giving up, I mean mid-dough roll I dropped the rolling pin and grabbed some oil and a ton of powdered sugar. Then the next thing that popped into my head was a beignet. Or a funnel cake. Or donuts. Or just any deep-fried sweet thing. 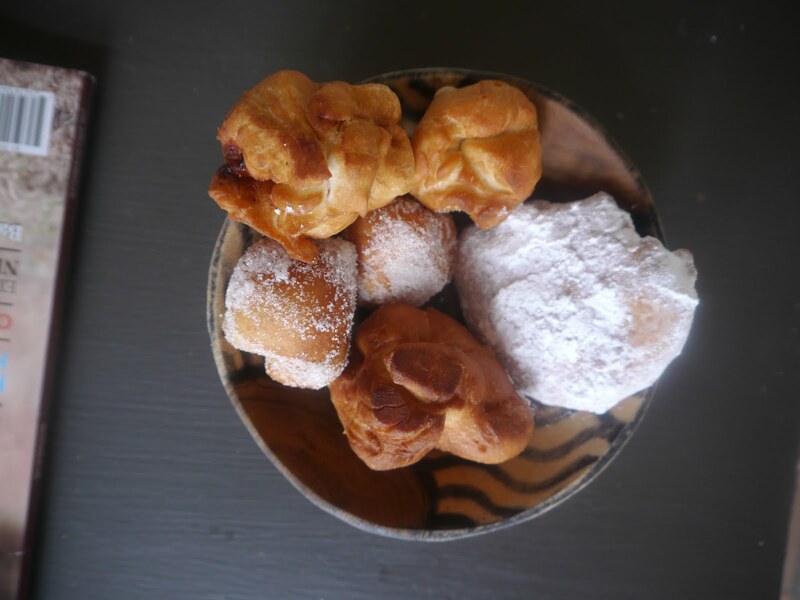 One thing beignets and funnel cakes have taught me is that you can fry any sort of dough and hide it under a pile of powdered sugar and you can't go wrong. 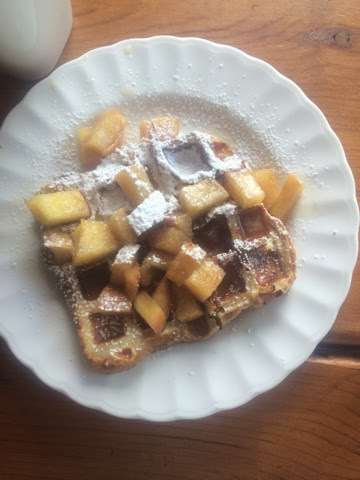 Okay, but they were actually so good! The dough was perfect for frying and made the most fluffy but still doughy-dense donuts you could dream of. Then I got real crazy and started stuffing them with anything and everything I could think of: ham & cheese, apple jam & cheddar, chocolate & marshmallows, cream cheese & chive, goat cheese and pesto... I literally grabbed as many ingredients that I thought had the slightest chance of being able to be stuffed in a piece of dough and fried. I went all out. And I'm so glad I did. 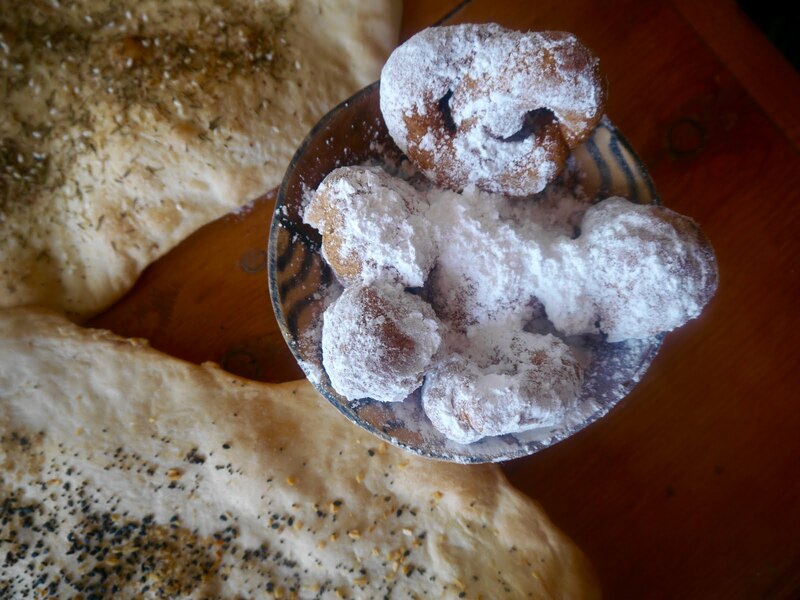 So, moral of the story... if you have any leftover dough: stuff it, fry it, roll it in cinnamon-sugar, cover it in powdered sugar..... you get the point. You won't be disappointed. Rub 1 tbs. of olive oil on each half of the eggplant (on the cut side). Leave the skin on the eggplant. Lay skin side up on a baking sheet and roast for 15 minutes. Flip, and roast for another 20 minutes on the other side, until the center of the eggplant is mushy. I like to get a charred flavor by turning the broiler on for the last 5 minutes that the inside is facing up, but you can also grill the eggplant to get the charred flavor. Let the eggplant cool completely. Scoop the insides of the eggplant out with a spoon into a bowl. Add in the rest of the ingredients and mash with a fork to combine. Add more salt, pepper, and lemon to taste. Once mixed, place in the refrigerator to chill before serving. I topped mine with a little more Za'atar for good measure. Mix the water and yeast together in an electric mixer mixing bowl. Let sit for 10 minutes or until foamy. Add the flour, salt, oil, and honey to the mixing bowl. 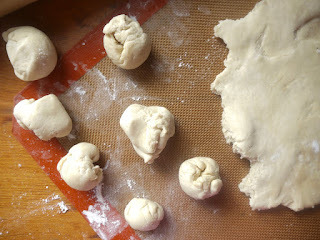 Using the dough attachment, let it mix for 10 minutes or until a completely combined dough has formed. Place dough in a lightly oiled large bowl and let sit for 10 minutes. Split into quarters, wrap in plastic wrap, and let rise for another 10-20 minutes. Roll each quarter out onto a floured surface until it is as thin as it can get without tearing. 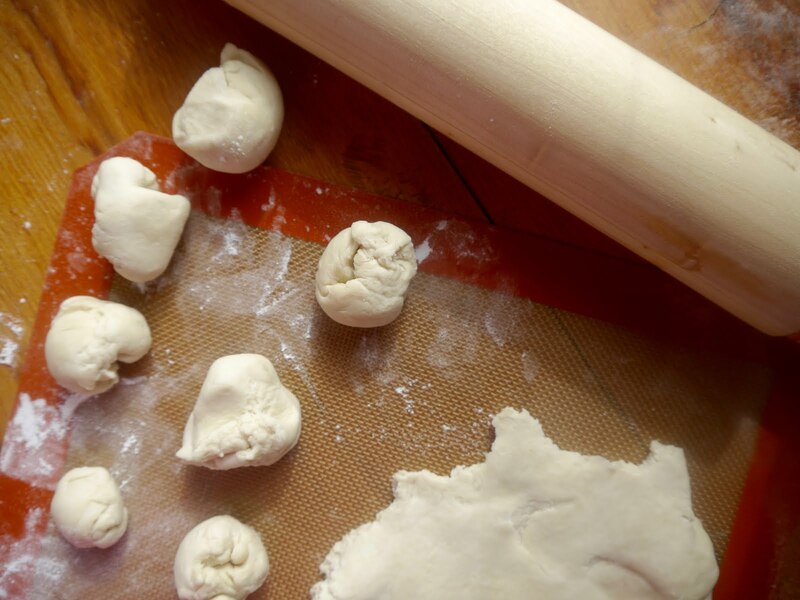 Flip a baking sheet over, lightly grease it, and lay the rolled out dough on top of the bottom of the sheet. 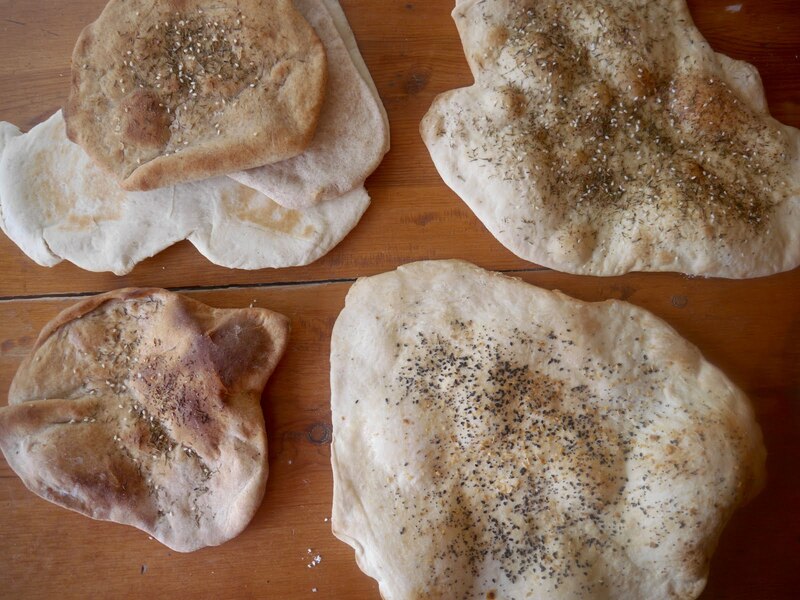 Brush with olive oil, sprinkle with za'atar and bake for 20 minutes, or until just golden brown. Cook longer if you want it crispier like a cracker, and then break up into pieces once cooled. I prefer mine softer like bread. Let cool on a wire rack. Or, if you're not feeling like lavash, you could also make my Wheat Za'atar Pita Bread to go with it. I made both because, well, I love to have options when I'm snacking. And now for the "little something special..."
Heat a pot filled with oil deep enough to fry, over medium-high heat. Once the oil sizzles, stuff the dough (if wanted) and drop into the oil until golden brown on each side (flip as needed). 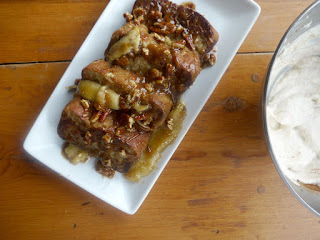 Immediately drop in cinnamon-sugar or regular sugar (if using those). If not, set on a paper towel-lined baking sheet to drain any excess oil off.